Harrison and Hetherington are holding a complete dispersal of the award winning Tweeddale British Blue herd on behalf of the Redhead and Watson families who farm at Bowsden Moor, Northumberland on 21st August at Borderway Mart in Carlisle. The herd of British Blue Cattle, which was set up ten years ago, has been built up to include over 60 followers, and on the day 91 lots will be up for sale. This will include 29 cows and heifers served and/or suckling, 8 in-calf heifers, 7 cross cows and pedigree calves or pregnant recipients, 12 maiden heifers, 12 young bulls and 23 lots of Grade A frozen embryos. 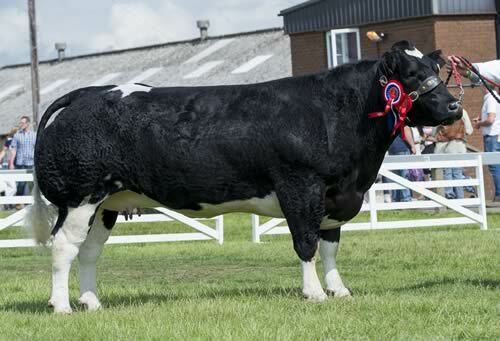 The Tweeddale herd have made history in the British Blue cattle industry at the Great Yorkshire Show, as it is the first time any British Blue has won Interbreed Champion at any of the major UK agricultural shows. This huge achievement comes less than one month before Tweeddale Hawkeye and fellow family members will be sold. Tweeddale Hawkeye is a three year old in calf heifer and is due to calve in October. “When we first established the herd it was always our intention to develop it over ten years and see how far we could take it. We started out with three heifers purchased from the Broomfield Herd, and have slowly built it up from there. What makes our achievements even more special is that Tweeddale Hawkeye is a granddaughter of one of our very first heifers. The family have always sold their cattle at Borderway, and in two of the last three years they have won the British Blue Sales Championships, so it was a natural decision to hold the dispersal there. “The Tweeddale British Blues have really made a name for themselves. Their cattle consistently reach high prices when up for sale, here at Borderway. The family are renowned for focusing on achieving and emphasising the key traits associated with the British Blue which is an excellent beef producer. Their cattle are bred for their large size, prominent double muscling, sloping rump, hidden hips, a straight back and mobility. Harrison & Hetherington are the appointed auctioneers for all major beef, dairy and sheep breed societies throughout the UK. The farmstock business is well known and respected by pedigree/commercial farmers nationwide and in specialist fields worldwide. Borderway is the UK’s largest and leading livestock sale centre, handling 800,000 head of cattle and sheep annually and providing a service to sellers/buyers from all geographic locations, including Europe.